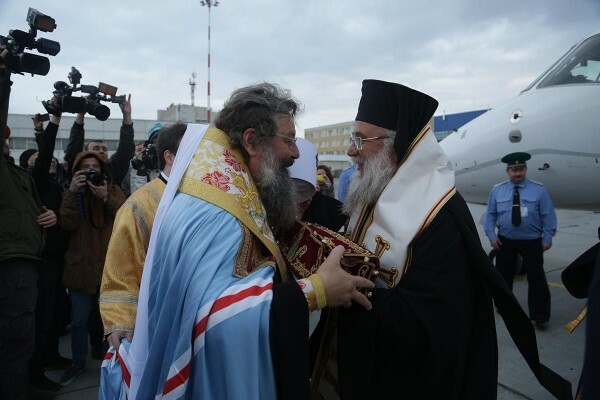 September 30, 2014 – A delegation of the Greek Orthodox Church led by Metropolitan Nektarios of Kerkyra, Paxoi and the Transmarine Isles brought from the Island of Corfu to Yekaterinburg the right had of St. Spyridon, Bishop of Trimythous. The shrine was solemnly met at Koltshovo Airport by Metropolitan Kirill of Yekaterinburg and Verkhoturye and Bishop Innokenty of Nizhniy Tagil and Serov. Then the relics were brought to the Church-on-the Blood. In the church, Metropolitan Nektarios, Metropolitan Kirill, Bishop Innokenty, Bishop Ambrose of Neftekamsk and Birsk and Bishop Innokenty of Magnitogorsk and Verkhneuralsk, assisted by the clergy of the Diocese of Yekaterinburg, celebrated a thanksgiving at the saint’s relics. In this archpastoral homily, Metropolitan Kirill thanked the delegation of the Church of Greece, noting that now the people and visitors in the city had an opportunity to touch the great shrine, and congratulated all the present on this event. In his response, Metropolitan Nektarios thanked Metropolitan Kirill for the generous welcome and said that St. Spyridon is the patron saint of the Island of Corfu and has saved it not once from various disasters. The faithful ask his intercession in all parts of the world, and today the faithful in Yekaterinburg has an opportunity to kiss his right hand and ask for his intercession. St. Spyridon’s relics will remain in the city till October 14. On October 1, the first Divine Liturgy was celebrated at the shrine with St. Spyridon’s relics by Metropolitan Nektarios, who was assisted by several bishops and the clergy of the Metropolis of Yekaterinburg. Among the worshippers were parishioners of the church and numerous pilgrims who came to Yekaterinburg to honour St. Spyridon. As a token of the joint service, Metropolitan Kirill presented the guest with a pectoral cross and pectoral icon made to mark the 700th birthday of St. Sergius of Radonezh. In his speech of gratitude, Metropolitan Nektarios noted that St. Spyridon gathered together all those who came to the church around “the spiritual table” – the Divine Liturgy. On October 3, Sverdlovsk Region Governor Yevgeny Kuyvashev met with the delegation of the Church of Greece and Metropolitan Kirill. Metropolitan Nektarios also celebrated the Liturgy on October 5, the 17th Sunday after Pentecost. That day also marked the third anniversary of the Metropolis of Yekaterinburg. During the service, an ardent prayer for peace in Ukraine was lifted up. After the Liturgy, Metropolitan Kirill greeted Metropolitan Nektarios and presented him with an icon of the Holy Tsar-Passion Bearer Nicholas II.